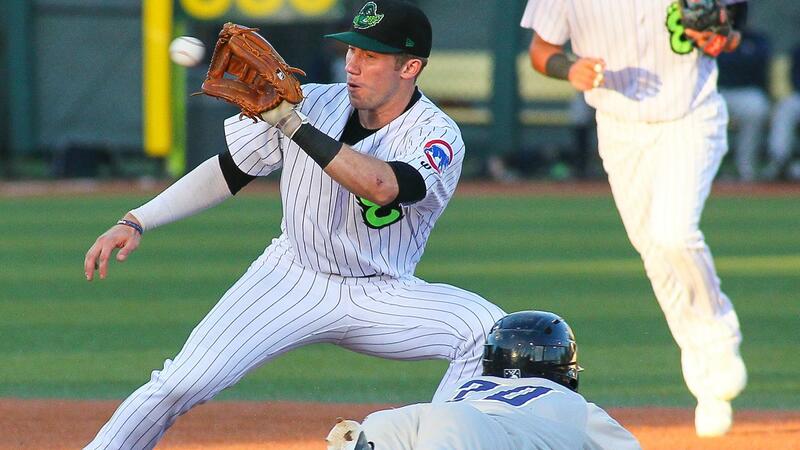 Eugene OR - After scoring 11 runs on the Tri-City Dust Devils on Sunday, the Eugene Emeralds felt the string of a large loss on Monday, giving up a season high 20 hits and 13 runs to fall 13-0 in front of 3,720 at PK Park. It was downhill from the beginning for the Ems (14-18, 28-42) when the Dust Devils (15-16, 33-36) scored a pair of runs in the second inning. Zach Mort (0-4) got Justin Paulsen to fly out to start the inning before giving up a single to Tre Carter. Carter then stole second before Luis Asuncion moved him to third with a single of his own. Asuncion then stole second, setting up Tyler Benson with an RBI opportunity on a ground out to the right side to score Carter and move Asuncion to third. Luke Becker then walked and, before he had a chance to steal, Mort threw away a pick-off attempt. Asuncion got home easily and made it a 2-0 game. Mort righted the ship from there, keeping the Dust Devils off the board for the rest of his outing. He lasted four innings while giving up five hits, two runs (one earned), a walk, and a strikeout. Casey Ryan relieved Mort in the fifth and ran into trouble. Ryan gave up back-to-back singles before a double steal moved runners to second and third. Blake Hunt then drove a ball to left to score one runner and move the other over to third. Michael Curry then tripled to score the second run of the inning to make it 4-0. Justin Paulsen doubled home Curry, prompting a mound visit before Tre Carter singled to score Paulsen and make it a 6-0 game. Ryan got out of the inning and handed the ball to Derek Casey, who struggled in the sixth. A walk to open the inning came around to score after two one-out singles. A pop out to Curry brought Paulsen to the plate with two on and two-out. He turned on a full count pitch and lifted it over the wall for a three-run home run, giving the Dust Devils a 10-0 lead. A run in the seventh on four straight singles and two more in the eighth on a Carter two-run homer ended the scoring. The Ems are now tied with the Salem-Keizer Volcanoes for the final playoff spot and will face them this week in a three game series starting Wednesday. If the Ems do make the playoffs, they will play at home against the Hillsboro Hops on Wednesday, September 5th.